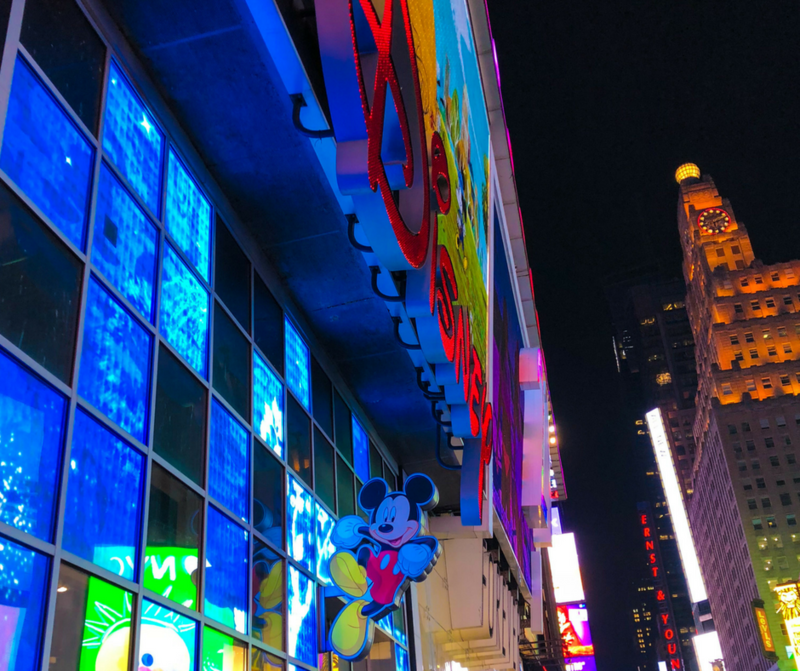 The Times Square Disney Store is a must-do for Disney fans while in New York City!! I’ve made a point to go to the Times Square Disney Store on each of my visits to NYC and the decor has changed each time I’ve been. but to be honest I would go in there even if the decor didn’t change!! This post contains affiliate links. It is at no additional cost to you, and I only recommend products/deals that will help you get the most out of your travel experience. Full Disclosure Click Here. So of course on all of my trips to the Big Apple I’ve made a point of fighting through Times Square chaos to visit the famous Disney Store that helped transform this once grungy, dangerous part of the city into the mecca it is today. Each time I’ve visited this Disney store the atmosphere is completely different and so magical! Even walking through the doors you are greeted by a “Cast Member”(that’s what all employees of Disney are called) stating “Welcome to Disney”. This is totally the droid you are looking for! Everyone needs a full-size stormtrooper right?! …and how cute is Minnie Mouse as the Statue of Liberty?!?! Also, I really wish I would have bought this shirt while I was on my trip!! Heck, the Tangled themed escalator alone is a reason to go back! Would this store be considered the “happiest store in NYC”?!? Have you been to the Times Square Disney Store?! Tell me about your trip in the comments below!! Subscribe Today to Receive Weekly Travel Adventures via Email!! Share the Fun with Your Friends!! Subscribe Today and Receive New Travel & Disney Tips Weekly via Email! Where Will Your Next Journey Take You?!? Vivacious Views is written by Britt, a Freelance Travel Writer and Disney Blogger from South Carolina. She has just returned from an April Trip to New York City and her 10th Trip to Disney World last May!! Britt is headed back to Disney World to celebrate the Halloween Festivities this October so be sure to Subscribe to Follow the Adventure!! Vivacious Views is in no way affiliated with, or employed by the Walt Disney Company. For official Disney info, visit the Disney site directly.